It’s time for ‘Japan by Prefecture‘ again! This is the series that aims to provide the highlights of each prefecture of Japan, along with my personal favourites and suggestions from readers. 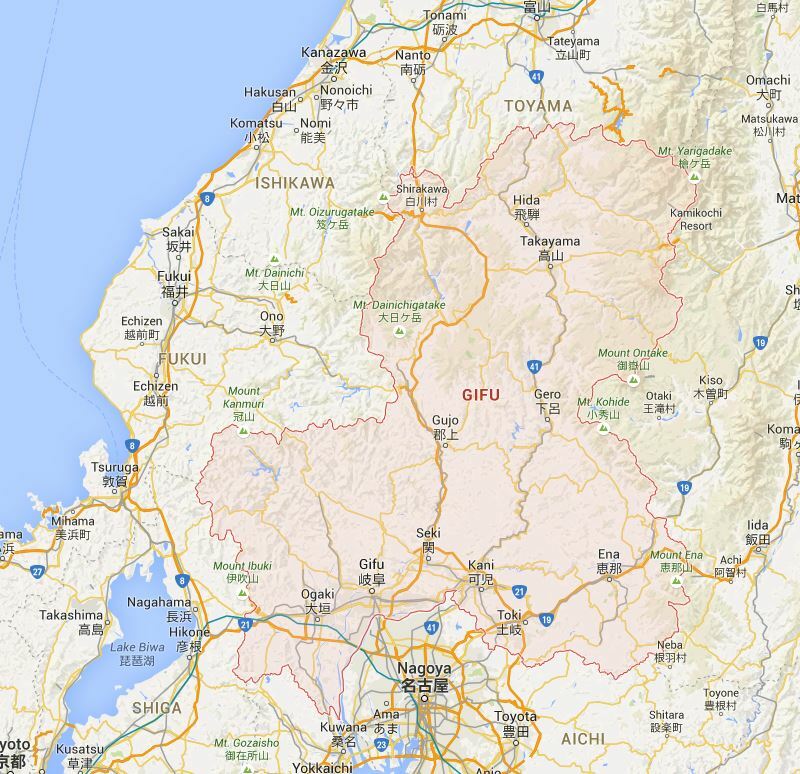 This week, we’re looking at Gifu (岐阜県). Gifu Prefecture is part of the Chubu Region (中部地方) and the capital is Gifu City (岐阜市). I’ve been to a couple of places in Gifu Prefecture, but seeing as I lived so close to Gifu I really don’t think I’ve explored it enough. Thank you to Zooming Japan, Ross L, Nathaniel, Japan Australia, Uncovering Japan and Sengoku Sophie for making some great suggestions for this week’s post. I may not cover everything here, but I’m grateful for your contributions all the same! 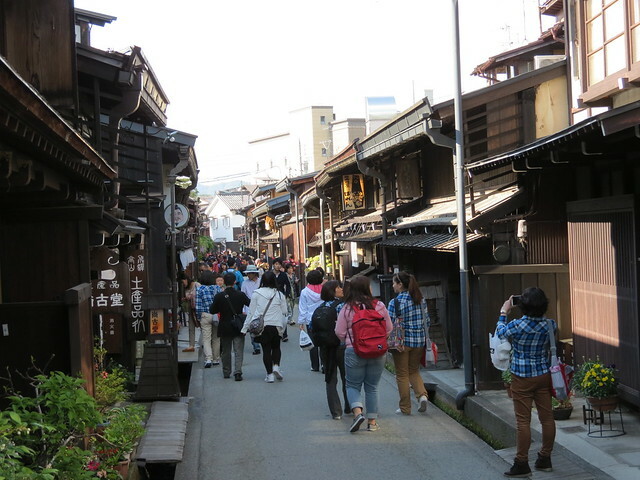 One of the most famous and most commonly visited areas in Gifu Prefecture is Takayama (高山). I visited last year for the first time and really liked the town. Takayama, or ‘Hida-Takayama’ as it is also known, is famous for its beautifully preserved old streets and merchant buildings, and also its beef and sake. Twice a year the Takayama Festival is held (in spring and autumn) and this is when the town comes to life with parades of ancient portable shrines, food stalls and people in traditional costumes. Also in Takayama is the Hida Folk Village (飛騨の里); an open air museum exhibiting over 30 traditional houses from the Hida region, which is the mountainous district of Gifu Prefecture around Takayama. Another very famous part of Gifu Prefecture, which I mentioned briefly in the Toyama Prefecture post, is Shirakawago (白川郷). 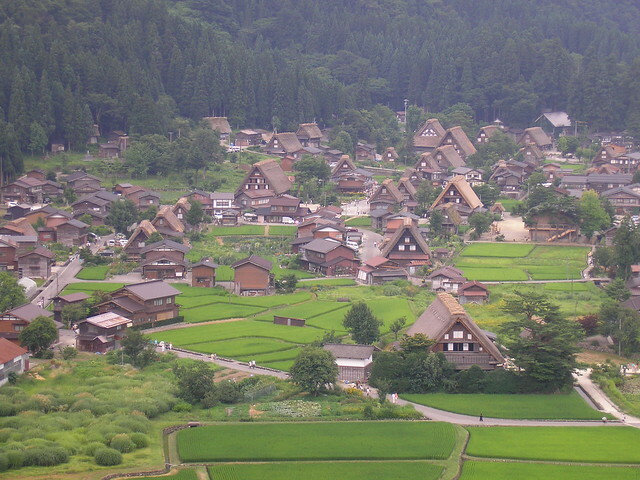 I have visited Shirakawago once, in 2008, but unfortunately it was a rainy day. I’d love to go back one day, perhaps in winter as that’s when the Gassho-zukuri (合掌造り) (praying hands houses) look absolutely beautiful in the snow. Shirakawago was declared a UNESCO World Heritage Site in 1995, and it’s a fantastic place to visit if you want to experience a Japan of years gone by. Ogimachi (荻町), the largest of Shirakawago’s villages, is the most popular with tourists, and it is even possible to stay in a farm house there over night. The above covers what I have seen of Gifu Prefecture, but there is more yet to see! 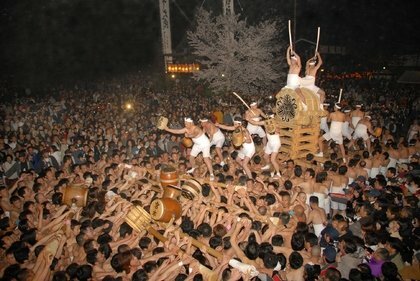 High on my list is Gujo Hachiman (郡上八幡), a small riverside town known for its waterways, summer dance festival and Gujo Hachiman Castle (郡上八幡城). 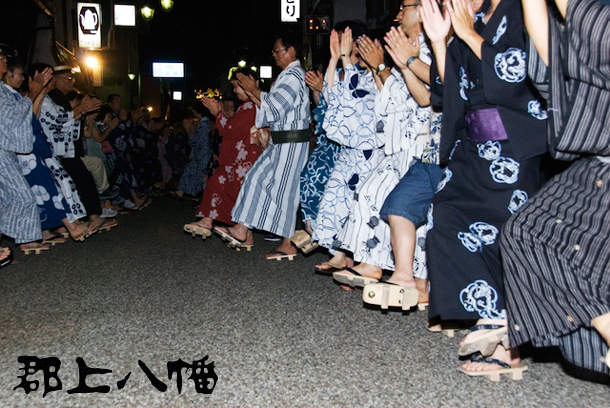 The Gujo Odori (a dance festival held in the summer) started over 400 years ago. It sounds like a really fun festival, taking place over a period of 31 nights between July and September. During Obon (お盆) (the summer festival of the dead) the dancing continues all night. Gujo Hachiman is also home to and producer of a lot of Japan’s replica plastic food usually seen in restaurant windows across Japan. Visitors can even have a go at making some as a souvenir to take home! If onsen (hot spring) towns are your thing, Gifu Prefecture has those too! Gero Onsen (下呂温泉), once referred to as one of Japan’s top three onsen by Confucian poet Hayashi Razan in the Edo Period, Gero Onsen is still popular with Japanese tourists today. Like most onsen towns, the best way to experience the hot spring baths is to get kitted out in your yukata (cotton robe) and geta (wooden shoes) and wander around the town from bath to bath with your wooden ‘Yumeguri Tegata’ or ‘spa pass’. Gero Onsen is more popular with Japanese tourists than with foreign tourists, but that means you’ll get a much more authentic experience when you visit. Finally (although I’m sure Gifu has even more to offer! ), I’ll mention Hida Furukawa (飛騨古川). Furukawa is only about 15 minutes away from Takayama by local train, and it’s another beautifully preserved, rural town. Furukawa is smaller than Takayama, and not as well known, but it’s still worth a visit if you’re looking for somewhere off the beaten path to explore. In April, just after the Takayama Spring Festival, the Furukawa Festival is held. This festival is a little livelier than the Takayama Festival, with barely dressed men carrying a large drum and beautiful portable shrines and floats through the town. A lot of the souvenirs (or ‘omiyage’ / おみやげ) from Gifu Prefecture feature a cute little character called Sarubobo (さるぼぼ). Sarubobo is a red (traditionally) baby monkey, and he appears as charms, soft toys, and on all sorts of edible souvenirs too. You can even get other famous characters, such as Hello Kitty, dressed up like a Sarubobo! 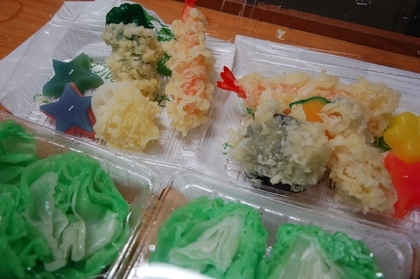 Traditional snacks such as rice crackers, or ‘senbei’ (煎餅), are also popular in Gifu Prefecture. Another traditional sweet souvenir from Gifu Prefecture is Mizu Manju (literally, ‘water dumplings’), which are traditionally eaten in the summer. As I mentioned above, Gujo Hachiman is famous for its production of plastic replica food, so this is also a top souvenir from this region. 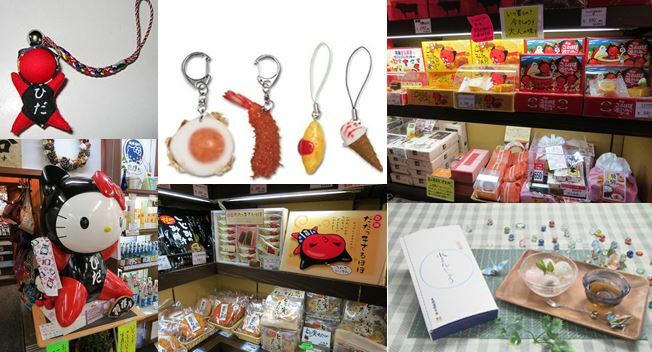 You can buy things such as tempura shrimp keyrings or sushi magnets! Next week I will be writing about Shizuoka (静岡県). Have you been there? What’s good to eat there and what omiyage should I buy? What are the best sightseeing spots or hidden gems? Please do share your thoughts below, and join me next week for Japan by Prefecture! 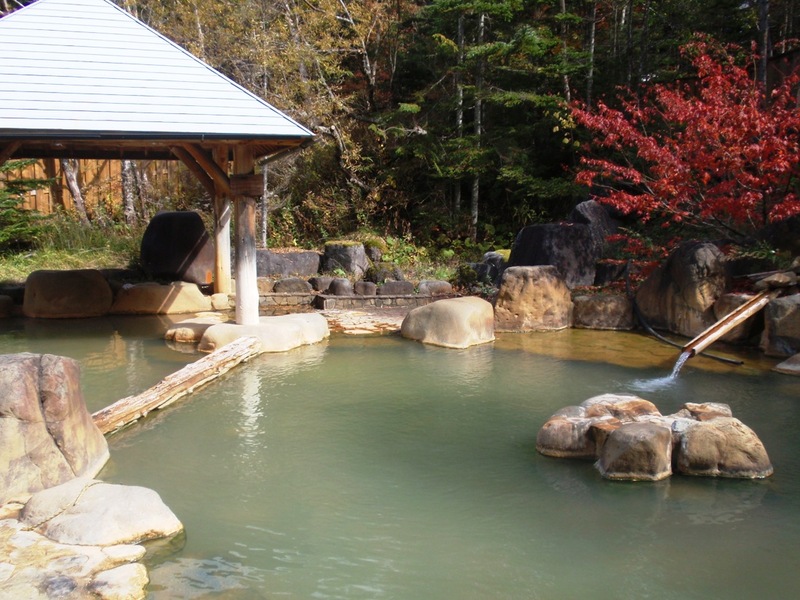 I could do with the Gero Onsen right about now… Brilliant blog post as always – this is one of my favourite features! I’ve been there many times. I climbed Mt. Fuji starting from the Fujinomiya Trail with is in Shizuoka. I visited various cities in Shizuoka such as Hamamatsu, Kakegawa or Fujieda. I also checked out the Izu Peninsula. It’s hard to tell what I liked best in Shizuoka. There are so many lovely places. Of course, I’m into the castles there. But the views of Mt. Fuji are stunning: Miho-no-Matsubara is great! 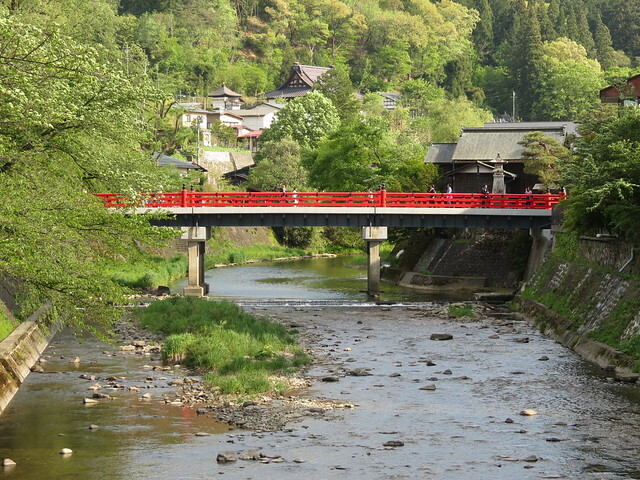 My home prefecture of Gifu is an amazing place in the heart of Japan full of culture and history. Thanks for mentioning so many great places. I hope many people will come and enjoy all that we have to offer. Another great post. I stayed in a gassho-zukuri in March once and it was the coldest I have ever been, but worth it for being in Shirakawago when all the coachtrips had left for the day. Nihondaira and Kunozan Tosho-gu shrine (linked to the shrines at Nikko and as such is very ornate). Nearby Shimizu is good for sushi and views of Fuji-san. Also, when I went to Shizuoka city in 2010 there was a giant Gundam statue that is pretty cool if you like that sort of thing but I’m not sure if it is still there now. This area is also known for fruit and tea so these are good omiyage. Thanks for stopping by, Paul! Yes, I think staying in a gassho-zukuri must be quite an experience – I’d love to do it one day! Thanks for the Shizuoka comments! Actually, I saw that Gundam statue too, but I wonder if it’s now the same one that’s in Tokyo Bay. I second Paul on the Kunozan Toshogu shrine. It was such a cool find – I had no idea that Tokugawa Ieyasu was buried there before being moved to Nikko. I also loved the Kawazu Nanadaru (7 Waterfalls) area of the Izu Peninsula. They do a really neat (small) lantern festival at the falls there for Tanabata. And you can see lots of fireflies there as well, in June.